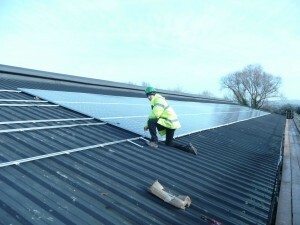 A local farming company in Herefordshire recently decided to install 2 Solar Pv arrays on two of their Turkey shed roofs. Turkey’s use a lot of electricity and the opportunity to be paid to generate their own was too good to turn down. 114 kW in total over the two arrays is providing a huge amount of the company’s electrical needs. The Efficient Energy Centre dealt with the project from start to finish, dealing with the G59 connection application to Western Power, the Energy Performance Certificate exemption survey, site visits and quotations through to commissioning, handover, filling out the feed in tariff application forms and even putting them in the post (recorded delivery of course). The installation of the panels took the best part of 2 weeks to complete, the inverters and generation meters are all neatly installed in the sheds themselves. The two arrays consist of 456 250w panels and create 97857kW of electricity per year! The company will achieve a 14.4% return on their investment minimum!